The tendons of the abductor pollicis longus and extensor pollicis brevis create The lateral border. The tendon of the extensor pollicis longus create The medial border. The scaphoid and trapezium, and the distal ends of the tendons of the extensor carpi radialis longus and extensor carpi radialis brevis create The floor of the impression. 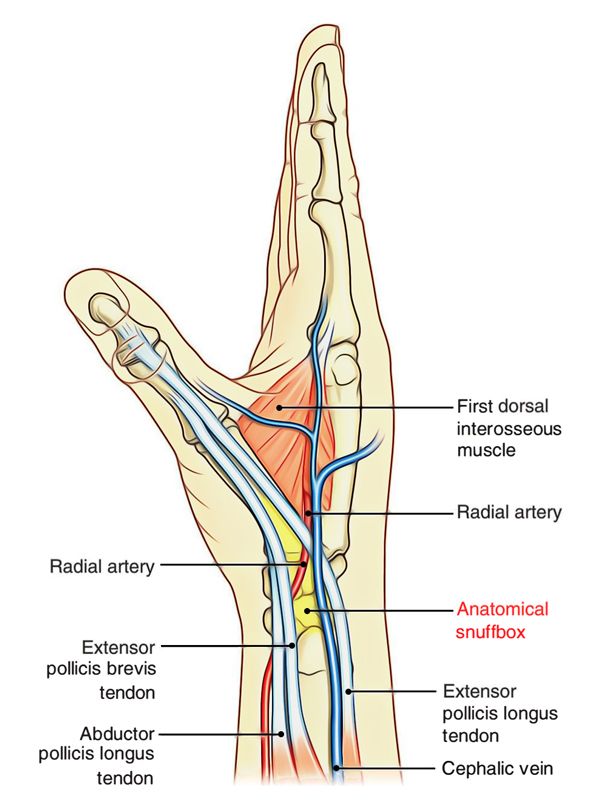 Deep to the extensor tendons of the thumb, the radial artery passes obliquely through the anatomical snuffbox and is located nearby to the scaphoid and trapezium. Terminal parts of the superficial branch of the radial nerve pass subcutaneously over the anatomical snuffbox as does the origin of the cephalic vein from the dorsal venous arch of the hand. The pulsations of radial artery can be felt in the anatomical box. The tenderness in the anatomical box indicates fracture of scaphoid bone. The cephalic vein at anatomical snuffbox is often used for giving intravenous fluids. The superficial branches of the radial nerve can be rolled over the tendon of extensor pollicis longus.